Special Containment Procedures: Due to the immovable nature of SCP-723, a containment area designated Site-288 is to be constructed surrounding the immediate area to prevent potential civilian casualties or exposing the site's properties. Containment consists of standard 3m (10ft approx.) chain link fencing with access restriction signage surrounding the site's exterior. A further restriction zone of 2m is to be constructed around the entrance to SCP-723, secured with magnetic locks. The site is to be secured by three guards in standard █████████ security company cover uniforms, without visible armament to avoid suspicion. Access restrictions are to be made based on the claim of the site's fragility and historical importance. Access to D-Class subjects for further experimentation is to be approved by level 4 staff or higher. Under no circumstances is SCP-723 to be ascended by SCP Foundation staff, and personnel are requested to stay clear of the interior restriction zone to avoid becoming subject to SCP-723's effects. Description: SCP-723 is a spiral stone staircase, hewn from ordinary limestone, contained within a ruined church located in sparsely populated ███████████████, England. 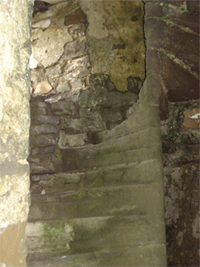 The stairs scale the interior of a ruined tower on the structure's eastern side. Each stair is approximately 0.75m (2.5ft) wide, ascending in a clockwise direction at a 42 degree incline. From the exterior, the site appears to be in a state of disrepair, including the tower which SCP-723 ascends; however, this damage is not visible from the interior of the tower, though the staircase is still visibly worn. SCP-723 also appears to extend further upwards than the exterior architecture suggests. The site was brought to the Foundation's attention in 20██, after the unexplained disappearances of several local youths. When ascended, SCP-723 induces rapid aging in the case of living subjects, and decay in the case of non-living materials. This effect seems to initiate after the fourth or fifth step has been climbed, each subsequent step inducing further aging or decay respectively. Subjects ascending the stairs have not indicated any feelings of pain or discomfort, and seem untroubled by their rapid transformation (with the exclusion of Experiment-723-A-9). Once an ascent has begun, subjects have no inclination of returning to the base of SCP-723. Although it is yet to be determined conclusively whether this is a compulsion is caused by SCP-723's effects or a result of physical changes in the brain, the former is considered more probable. Stairs and church are characteristic of the pre-Romanesque architectural style. Historical research indicates that the building containing SCP-723 was indeed a functioning church dating from at least the 9th century, if not earlier, however recent archaeological investigations suggest that Roman architecture existed on the site predating the construction of the church. The site has undergone several major repairs since its construction, but is believed to have fallen into disuse some time during the 11th century. Although no specific records exist, local folklore suggests the building was abandoned during this time coinciding with a series of suspicious deaths, and distrust of the church remains within the local population. This same folklore references a 'sacred stair', which is believed to be a reference to SCP-723. It is not known whether SCP-723 gained its properties at this time, or whether they existed prior to this event. Due to the spiral structure of SCP-723, direct observation of anything past a single story is impossible. Electronic equipment such as video and sound recorders or GPS locators have been shown to undergo a similar aging process to subjects, and transmitted signals typically fail after a single story has been scaled, making further observation problematic. This has been somewhat circumvented by the use of cables directly linking observers to the subject, allowing video contact to remain until the second story, and audio until the fourth. A series of experiments were conducted commencing 20██ to determine the nature and extent of SCP-723. Results: Subject was instructed to remain in verbal contact with the overseers throughout the test via the transceiver, and ascended the stairs as normal. The subject's expression underwent visible change as they crossed the fourth step, paused, and then continued to climb after prompting from test overseers. Signal from audio transceiver ceased approximately twenty seconds after visual contact was lost. Subject did not respond to further prompts, both via the transceiver and vocally. Video recordings were unable to be recovered. Notes: Standard recording methods are ineffectual. Recommended that alternatives be explored in future experiments. Equipment: Handheld camcorder and audio transceiver, both connected to monitors at the staircase's base via standard, plastic coated copper cable. Results: Subject agreed to ascend the stairs after being forcefully restrained by security. Subject was then instructed similarly to the previous experiment, with the addition of trailing the cable behind them as they climbed. After crossing the fifth step, subject sharply inhaled but continued forwards. Video and audio signal was maintained once visual contact had been lost, but began to rapidly deteriorate. Subject was asked to report any visual or audible anomalies, to which they responded that they were 'feeling fine'. When asked to elaborate, the subject mumbled indecipherably. At this the subject raises their hands to examine them in front of the video feed, which now appear to be visibly more calloused. Video feed is lost soon after, but audio feed remains for eight more minutes. Subject begins to breathe heavily into the microphone, as audio signal gradually degrades. Subject is directed to stop climbing but doesn't respond. Shortly before audio signal is lost, subject again mumbles something indecipherable, but it is believed they may have said 'daughter' or 'slaughter'. Reeling in copper cable revealed significant degradation in the metal and plastic, progressively more advanced towards the subject's end. Cable was no longer attached to recording devices. Notes: SCP-723 appears to degrade both biological and non-living matter. Subjects also appear to be either unwilling or unable to respond to overseer requests. Recommended that methods to recover subjects and equipment be enacted in future experiments. It is also notable that the remains of the previous subjects were not observed or described at any point during the ascent. Equipment: Handheld camcorder and audio transceiver, both connected to monitors at the staircase's base via standard, plastic coated copper cable; titanium-█████████ alloy cable attached to both subject and recording equipment. Results: Subject was instructed as per the previous test, and began climbing SCP-723 with caution, again pausing briefly as the fourth step was crossed. Subject proved more responsive than previous test subjects, describing the air inside the staircase as 'cold, really cold', and that the stairs were 'covered with dust, thick grainy stuff'. Subject also stated that they were 'sorry', and began crying shortly after. Due to lack of video feed by this point, subject was encouraged to continue to climb and to describe anything that they saw. After approximately twelve minutes, subject began speaking rapidly into the microphone, but the signal was much too degraded to understand words. With the prospect of a potential discovery, and the fact that cables had remained taut until this point, the decision was made to retract the cables and recover the subject. No strong resistance was met, and after five minutes subject was pulled to the entrance. Although still alive at this point, the subject's physical appearance was significantly altered. Muscle mass had diminished greatly, hair had thinned and skin was extremely dry and discoloured. Although it had become loose and wrinkled in some areas, in other areas it was extremely taut, most notably on the face, atypical of normal human aging. The subject was not observed to blink during the four minute period before expiry, and was in a state of extreme distress. Though most of what was said during this time is unintelligible, subject refers at one point to what is possibly 'door' or 'the door', and refers several times to 'dark', 'mark' or 'f███'. Several broken and fractured bones were determined postmortem, believed to be a result of the subject's forced extraction. Although the subject did not complain of pain during the climb, bones were also shown to have been leached of minerals, joints had calcified into severe arthritis, tumorous growths were found behind the subject’s right eyeball and in the prostate, and several ulcers were found in the stomach lining. Notes: The statements made by the subject may suggest that SCP-723 may terminate shortly after the fourth floor. The fact that lucidity also remains suggests that there may be limitations to the compulsions caused by SCP-723's, if they are present at all.